getting promoted to black belt. 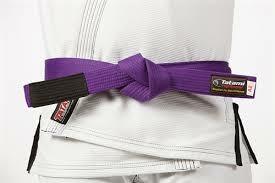 That is if you are planning to get your black belt certified by the IBJJF when the time comes. We do not force our students to be IBJJF certified or members of the IBJJF. Stuart and myself are IBJJF black belt certified (first degree) and our club is IBJJF registered. So if you are satisfied to be promoted to black belt level by our instructors, that is fine and we are ok with it. As you can always go under our umbrella and your students and so and so on. But you are contemplating that one day you would like to be IBJJF black belt certified, then it is more practical to start this process by getting your membership from purple belt to start with.